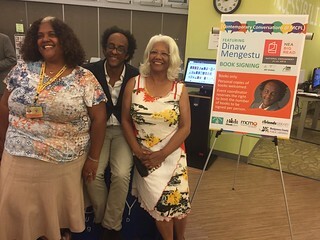 FOLMC, a lead partner organization with MCPL, hosted author talks, book discussions, lively cultural celebrations, and other activities including food and music centered on the debut novel of Ethiopian author Dinaw Mengestu, The Beautiful Things That Heaven Bears. This award-winning book captures immigrant life and was used as a way to promote discussions relevant to the Montgomery County immigrant experience. Check out the book at MCPL or visit our bookstores to purchase. Thanks to the Montgomery County community for participating; we’re proud to be a partner of Big Read Montgomery. 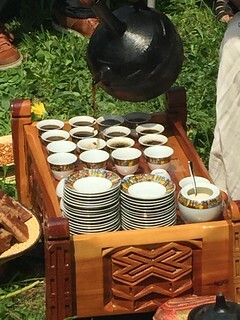 The Ethiopian ceremony was held at our Wheaton Bookstore in partnership with Blessed Coffee. Hear award-winning author and MacArthur Foundation Fellow, Dinaw Mengestu speak about his inspiration for his work The Beautiful Things That Heaven Bears. View photos from the ceremony. Sponsored by FOLMC, MCPL, and Friends of the Library, Silver Spring Chapter. The American Promise: The Immigrant View is a new series of oral history promotional spots produced by Montgomery Community Media as part of NEA Big Read Montgomery. Three of the top ten most diverse cities in the US are located in Montgomery County, according to a 2018 report by the personal finance website WalletHub*. However, in reality immigrant voices are rarely heard. Four residents break the silence and share their views on the immigrant experience in Montgomery County. The residents’ oral histories provide insights and reactions to building new lives here and offer tips to new arrivals. A panel of well-known Montgomery County immigrant Americans discuss their unique experiences with author and journalist Steve Roberts. Panel includes Frank Islam, Ola Sage, and Reemberto Rodriguez. 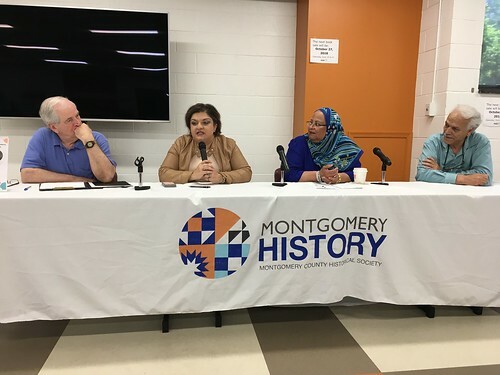 The former featured residents from different countries to discuss what it is like to be Muslim in Montgomery County. The latter looked at patterns of migration in 1950s Montgomery County using historical data and life history interviews. We have new and used copies available at our bookstores. Want it delivered straight to your door? Purchase The Beautiful Things That Heaven Bears through our Amazon Associates link and FOLMC will receive a portion of the sales. FOLMC is a participant in the Amazon Services LLC Associates Program, an affiliate advertising program designed to provide a means for sites to earn advertising fees by advertising and linking to Amazon.com. Expand your reading beyond The Beautiful Things That Heaven Bears. MCPL compiled suggested reading lists with recommended fiction and nonfiction titles for readers of all ages. Visit our bookstores for more NEA Big Read books. The Big Read, an initiative of the National Endowment for Arts (NEA), is a community reading program designed around a single book. Our literary partner Montgomery Community Media (MCM) is among 75 nonprofit organizations to receive a grant to host the NEA Big Read project in our community from April to June 2018.